Since I posted this strange Google search result last month, I have to share this one, too. It’s a search that I did yesterday on Google. But first, a quick background. We have a U2 fan forum as part of @U2, my long-running U2 site. Forums attract a lot of spammers, as many of you know. When a suspicious account registers on the forum, I’ll often do a Google search for the username to see if this spammer has been setting up accounts on other forums. The search term is usually (username) forum profile. Historically, Google does a fantastic job of showing me other forum profile pages with the same username as the new account on our forum. That was then, this is now. 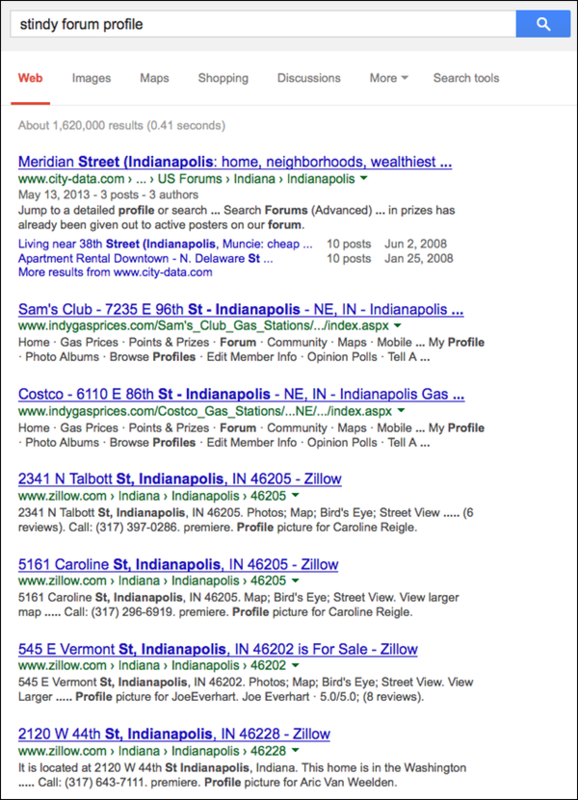 The entire first page took the “stindy” username and translated it into a search for streets in Indianapolis. Not a single “forum profile” result. In fact, there were no forum results until the bottom of page three. The first 27 results looked like what you see above. It does – thx Donna. I’ll try things like that next time, too. That’s an interesting result. Seems like Google failed to recognize ‘stindy’ as a word so it tries to figure out if it’s a malformed query, particularly since ‘forum profile’ is so generic. It probably has to identify where to break the word, a type of bigram analysis. Then there’s a defined pattern of text around ‘st, indianapolis’ and indianapolis is an entity that is often referred to as indy. So it figures that’s what you meant. You can get the same type of results using stphilly or aveindy. Probably Stindy might not be a forum spammer and also stindy must be a pretty new username and have not registered on other forums with that name , Another Possibility is that Google has not yet indexed that user’s profile. Every day Google is coming out with something new. Its not only effecting their business but also bringing a very negative impact on all the people who are dependent on Google for livelihood. Nothing is clear to us. The whole SEO industry is upside down. Frankly, Prateek, any business that depends on Google for its livelihood deserves whatever comes its way. Relying on free traffic from a source that can change at any moment is a terrible, terrible way to do business. « Optimizing for Twitter People Search: Does a Keyword in Your Name Help?